The following piece is an excerpt from a memoir cookbook I’ve been working on for over a year. 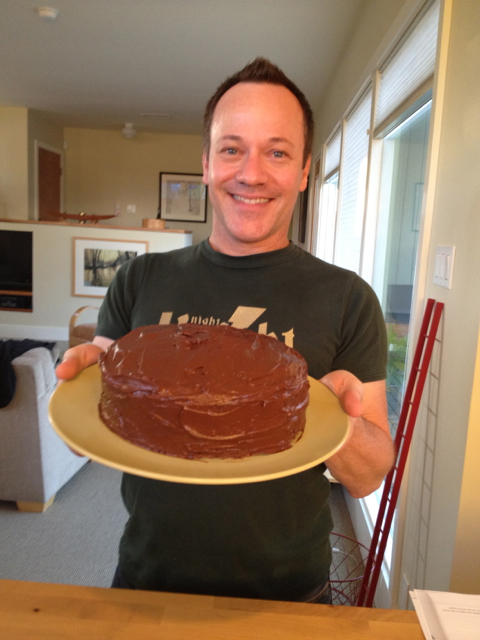 In preparing this post, I realized that I haven’t ever posted the recipe for the Laguna Writers Brownies on my blog. It has a central spot on my web site, but still: it seems wrong that it hasn’t appeared here yet. So please find the brownie recipe at the bottom of this page, after the excerpt. I really learned to cook in my early forties. I roasted chickens and ducks, and the occasional goose. I made stews and sauces, and eventually even mastered Thanksgiving dinner. Friends often ask me how I make my roasted root vegetables, and with absolutely no sarcasm at all I reply, “I cut them up and roast them.” (Actually, I’m usually more specific than that, but the recipe is really just olive oil, a red onion, and an oven set to 375 degrees Fahrenheit.) I am so thankful for the family and friends who encouraged me to cook, but my first love always has been, and always will be, baking. I can’t actually remember a time in my childhood when I didn’t bake. 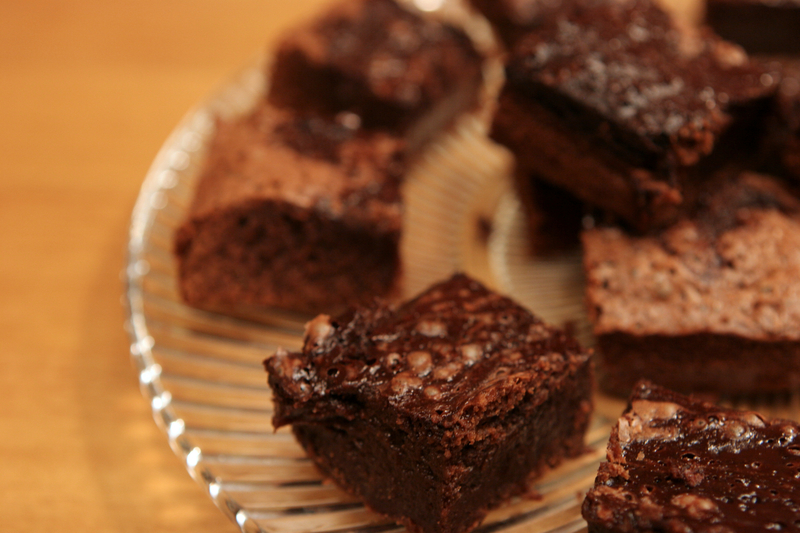 Some of my earliest memories—when I was only four or five years old—are in the kitchen with Mom, making brownies. I vividly remember mixing together the sugar, butter, and eggs, adding cocoa, topping off a measuring cup of flour with a butter knife, and watching the alchemy of batter rising in a pan in the oven. When I began my writing workshops more than thirty years later, it was Mom’s brownie recipe that inspired me to create my crowd-pleasing Laguna Writers Brownies. I wish I could tell you I’ve never burned sugar in an attempt to caramelize it, but it isn’t true. (The secret there is stay put: don’t leave the pan for even a second!) Still, I rarely burn something. My nose for when something is done is keen; I have a baker’s nose (inherited from my father). I can smell when that cake needs to come out of the oven. We weren’t sugar shamed or sugar denied in my family, but we were sugar controlled, understandably. Even if you hadn’t finished your entire dinner, you could still have dessert, but dessert before a meal was equal to swearing or fighting: not what a well mannered child did, at least not within range of our mother’s wide radar. I swore for years that she really did have eyes in the back of her head. I know she had bionic ears (I have inherited those from her). She also had great emotional intelligence, and could easily catch you in a lie. In other words: we followed her rules. My Grandpap (my Mom’s dad ) was no different. He used to give us a chewy ginger cookie while we were still working our way through a thick slice of chocolate cake and a big scoop of vanilla ice cream. He was a sugar pusher, for sure. I guess you could say I come from a long line of sweethearts, and baking is one way I connect to them over and over again. Melt chocolate in a double-boiler until smooth, and then add the butter in pieces. Mix melted chocolate and butter together until smooth. Remove from heat and pour into a separate bowl. (If microwaving, you can do this all in one bowl). Add the sugar to the chocolate and butter mixture and mix thoroughly. Add remaining ingredients, except flour, which should be mixed in separately and last. Stir together until smooth, and pour into a greased (buttered) eight inch, square baking pan. To make the brownies extra fudge-like, melt an additional ounce of chocolate in the double-boiler with three tablespoons of water (if using a microwave, heat one minute on high). Mix water and melted chocolate together until the mixture is thick, but pourable, like gravy. Spoon the melted chocolate over the top of the brownie mixture in the pan in thin strips, from top to bottom, and also from side to side (making a criss-cross pattern on the top of the mixture). Run a butter knife through this pattern to form a ragged “fleurs-de-lis” pattern that will melt into the top and take the brownies to a whole new level. (A special thanks to AWA Affiliate Joan-Marie Wood, who taught me this). Place rack in the upper third of oven, and bake at 350 degrees for about 28 minutes, or until edges begin to brown. Cut into small squares.